Character Pack: Heroes of the Wild contains thirty-two additional Character screens for Dungeons & Dragons Dragonfire. Additional distinctive races are featured, including Lizardfolk, Tabaxi, Kenku and Githyanki. Other cards bring new mixes of class and race together to fill out your adventuring party the way you see fit. 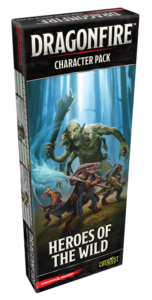 This pack also includes a bevy of new Market cards, as well as Subclass Features, from Forge Domain to Cavalier, War Magic to Assassin, and more!